I love the Holiday Season and making Christmas Cards. 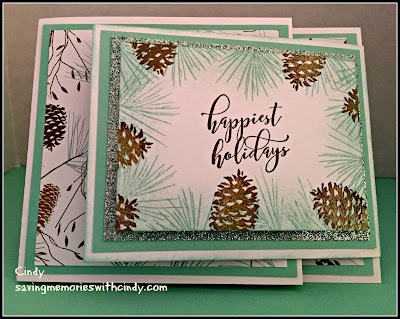 This year, Close To My Heart has two great looking Holiday paper packs. Yesterday I spent the morning working with "Oh Deer!" The designs are just what you would expect and so much more. Deer, snowflakes and stars are featured. But, it is the color scheme that is surprising. Sea glass, the CTMH color of the year is highlighted along with soft shades of brown. I wanted to do a fun fold card. I remembered how I had used to do flap fold cards so I dug through my old papers and found the measurements. Let me give you the measurements and scoring lines for cutting this card. 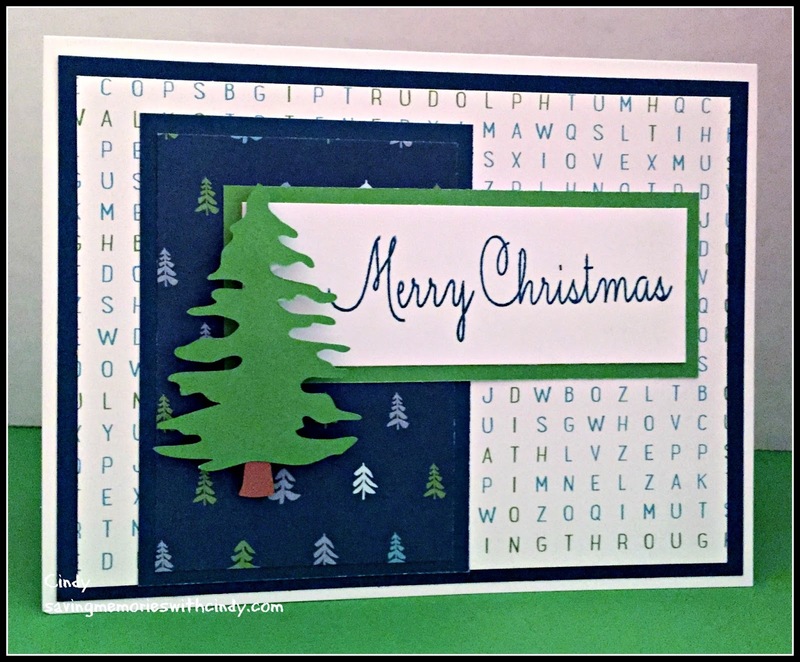 Attach the 11/2 inch flap to the back of the card on the 5 1/2 inch side and decorate as you wish. I can't believe that it is November already! Time to really put the last push on the Holiday cards. 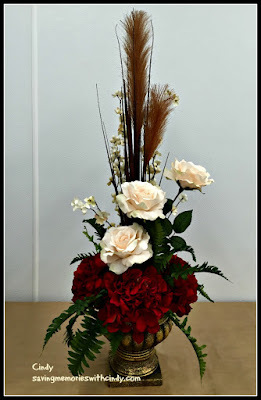 I've been working like crazy at work designing all kinds of floral arrangements (over 600 already) and will post a few soon. If you like Oh Deer! stop by my website to see it further and to maybe even purchase a packet for yourself. 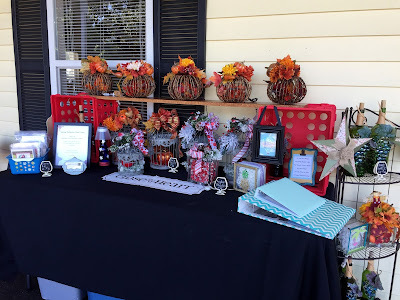 Also, stop by my friend Karen's Blog to see what she has been doing. For Now, Happy Crafting! Well, the time has come to post another example of CTMH's City Sidewalks paper packets. 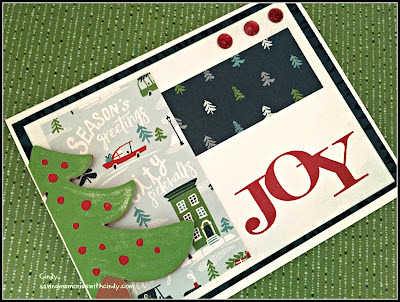 This is a fun and very useable Holiday packet that is available in the Seasonal Expressions II mini Idea Book. I like the fact that it features not only Willow (one of the new colors) but also features Cranberry. Cranberry has been a mainstay color since before I became a consultant. City Sidewalks even has a coordinating Cricut Cartridge! 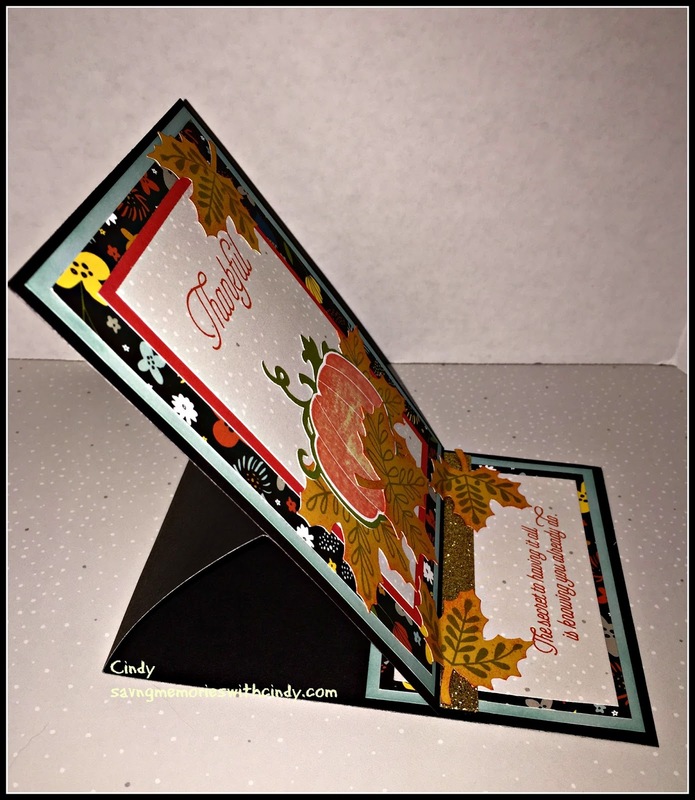 To complete this card, I used 2 of the patterns included I the paper packet. By the way, the product number of City Sidewalks is X7213B. "Joy" can be found in the stamp set called Very Merry (D1694.) Look at the tree...don't you love it! It is from the coordinating Cricut Cartridge. The images match the papers. The possibilities with CTMH never end! Did I mention that the new 2017 Planner has been released?!? I don't have mine yet, but it is on order. Stop by my website to see the planner and to check out City Sidewalks for your self. Also, don't forget to check out my friend Karen's Blog for even more CTMH inspiration. For Now, Happy Crafting! I am sorry that I am a day or so late with my post. I participated in a craft fair at my Community. I had a table last year so when the opportunity came up again this year, it had to be done. But, I will tell you that having a table is a lot of preparation work. This month, Karen and I have decided to highlight City Sidewalks (X7213B.) This is a colorful paper packet that features Willow...one of CTMH's new colors. CTMH came up with a great idea this year...they have a separate package of the featured colored cardstock. This gives you the opportunity to have extra sheets to make more cards and scrapbook layouts. The City Sidewalks packet includes 12 sheets... 3 each of Cranberry, Lagoon, Peacock and Willow. As I mentioned earlier, I did a craft fair this weekend. This is my table. Many of the items I sold were items that had been made at the craft class that I teach here at the Community. Of course I always have my cards and my scrapbooks. I love to make Christmas Cards. This year, Close To My Heart has two wonderful paper packets to make those cards with. Next month, Karen and I will be featuring the other one...I shall keep you in suspense. Don't forget to stop by Karen's Blog for more samples of artwork using City Sidewalks. Also, don't forget to stop by my website for more information or to purchase your set of City Sidewalks. For Now, Happy Crafting! 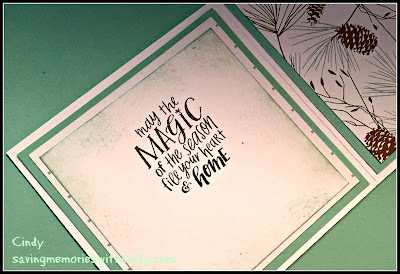 Karen has done it again...check out her blog...My Paper Studio...for her latest creation using Close To My Heart Swan Lake and the stamp of the month called Blessed Beyond Measure. Don't forget to stop back soon to see more fun fall projects. For Now, Happy Crafting! 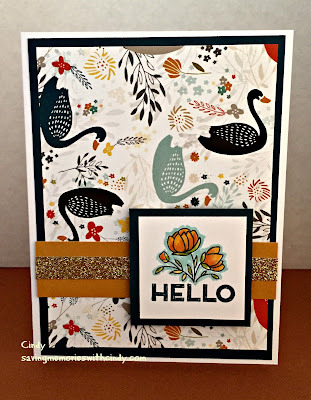 Another week has gone by and it is my turn to post a project using the new Close To My Heart paper packet called Swan Lake (X7212B) and the September Stamp of the Month called Blessed Beyond Measure (S1609.) Swan Lake is featured in the Seasonal Expressions book. It is a versatile packet that includes a sheet with swans, others with fall designs and still others with coordinating abstract patterns. 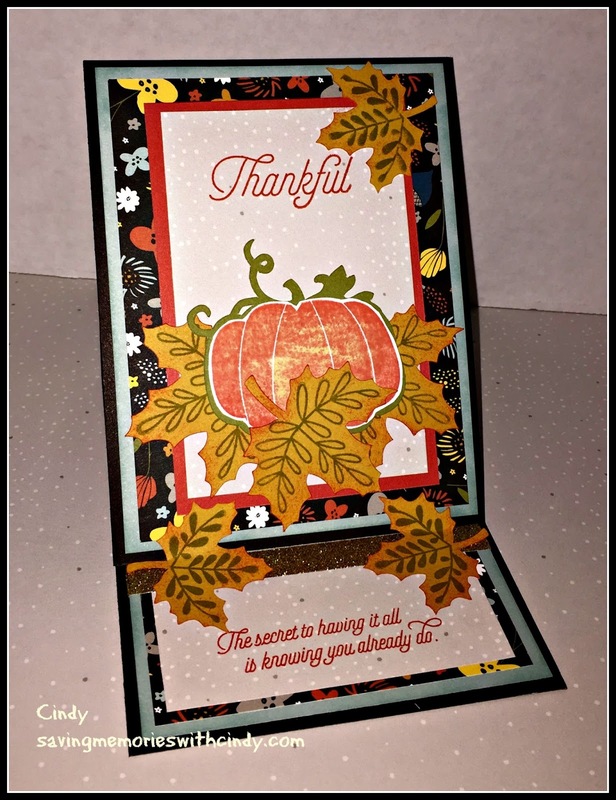 The STOM is Thanksgiving themed with a pumpkin, leaves and several sentiments. I got energetic this morning and decided to create an easel card. I haven't done one of these is quite a while so let's review the measurements. First cut a base measuring 4 1/4 x 11 inches. Score it at the 2 3/4 inch and 5 1/2 inch mark. Cut another sheet that measures 4 1/4 x 5 1/2 inches. This sheet will attach to the 2 3/4 inch folded tab. When assembled, this makes a perfect A2 card (5 1/2 x 4 1/4 inches.) This will make more sense when you see the card! Now you can see how the card folds along the score lines. When unfolded, and placed flat, it will fit perfectly into an envelope. I had fun making this card because I used so many fun tools, techniques and colors. I used the CTMH Artbooking cartridge to cut the pumpkin in Fern Card Stock. I then stamped the pumpkin on White Daisy using the rock and roll inking techniques. 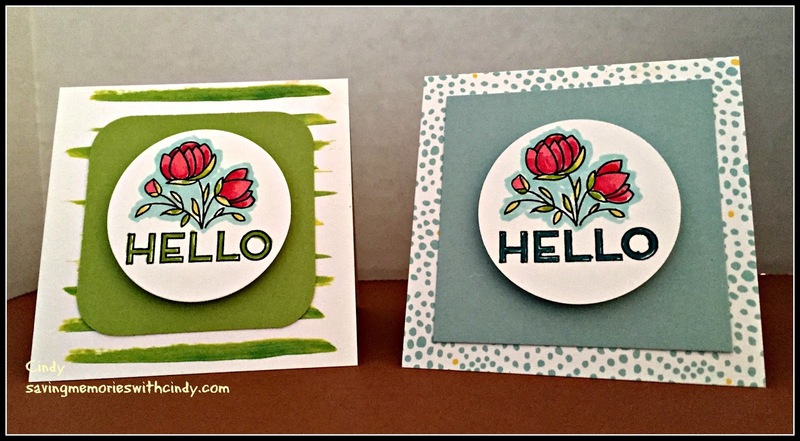 First I inked the stamp in Flaxen and then rolled the edges in Poppy to create the 2 tone look. I cut out the stamped image and the attached it to the Fern pumpkin leaving the stems showing. Also using Artbooking, I cut out the leaves in Goldrush and then stamped the veins using Fern Ink. I sponged the edges lightly with Poppy ink to give the fall like appearance. Helping to hold up the focal mat is a strip of gold shimmer tape. The smaller leaves also act as a wedge to help stabilize the fold. Here is the front of the card again so hopefully this makes some sense. I you remember, my friend Karen and I are taking turns showcasing CTMH products. 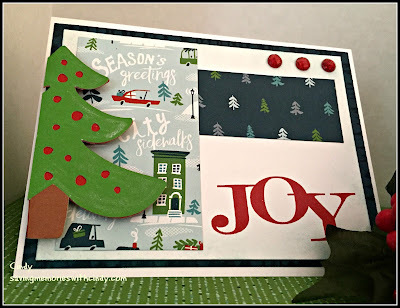 Don't forget to hop over to her blog to see what she has created. By the way, Swan Lake will only be available through November and the Stamp of the Month will only be available during September. Check out my website for more information. For Now, Happy Crafting! Close To My Heart Holiday Expressions Idea Book 2016 is Here! Every year, I eagerly wait for Close To My Heart to release the Holiday paper packets. Now is the time to take a look at this year's selection. You can see the papers at my website. You can also see a sample of one of the new papers called Swan Lake (X7212B) over at my friend Karen's Blog. 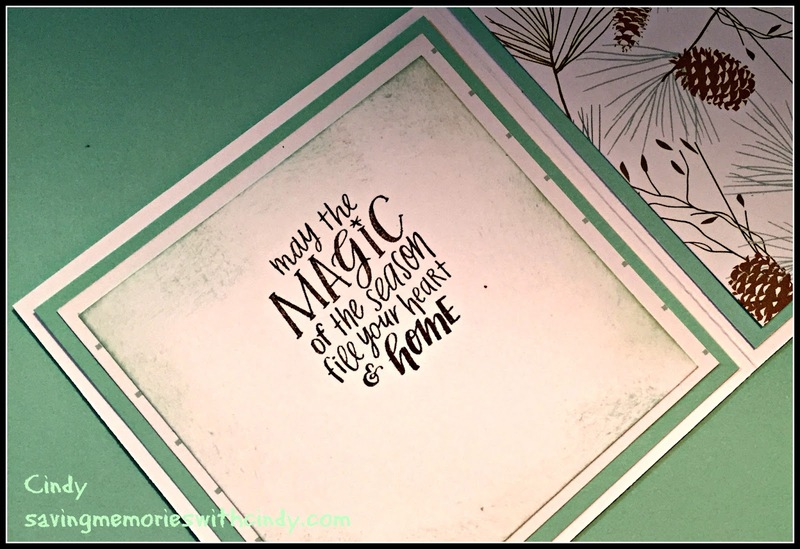 She has prepared a great card for us using that paper packet along with the CTMH September Stamp of the Month. 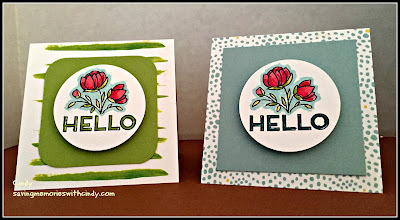 Hope on over to Karen's Blog to check it out! I just love a few of the special things she did, but you will have to hop to her blog to check them out. For fun, I'm sharing a couple other things I've recently made. If you remember, I am the Floral Designer at my local Michaels Arts and Crafts Store. Here is one of my recent arrangements. I also teach a monthly class at my Community Center and I thought I would share the upcoming project.